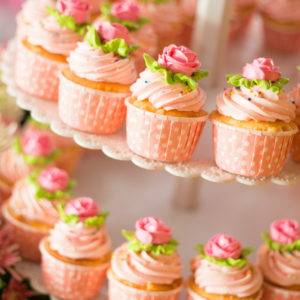 Perfect little finshing touch to a baby shower. 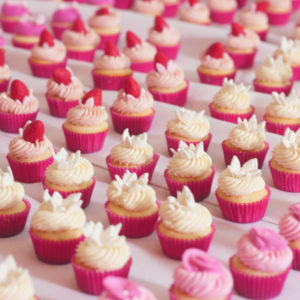 Bite size cupcakes to match your wedding theme and colours. 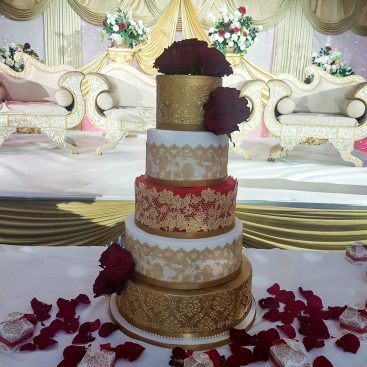 Flavours, colours and decorations are fully customisable. 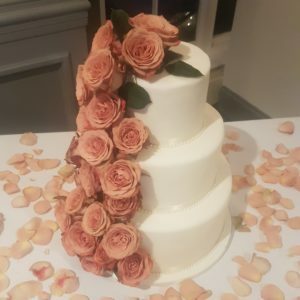 A gorgeous four tier cake with hand made edible sugar flowers. 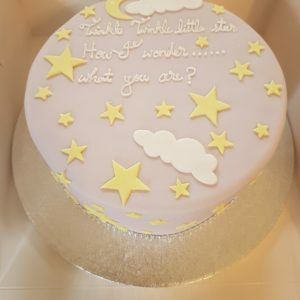 Sizes, decorations and cake flavours are fully customisable. Please click here for more information on delivery and set-up charges. 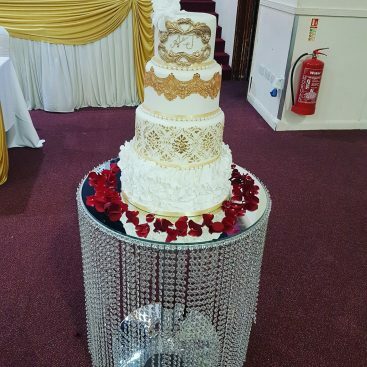 Our beautiful wedding cake featuring ivory, white and blue fresh flowers along with touches of gold. 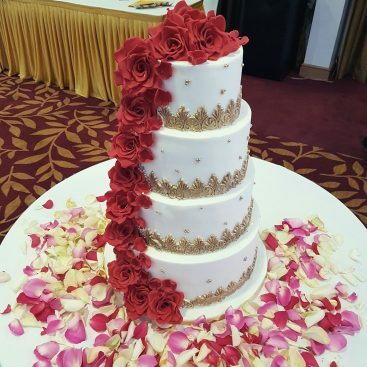 Bollywood Cake I: Wedding cake with red and gold roses, other floral decorations and royal icing details on the front. Colour, sizes and cake flavours are fully customisable. Please click here for more information on delivery and set-up charges. 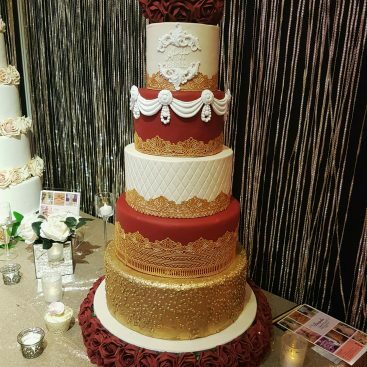 Bollywood Colours 1: Wedding cake in rich colours with hand painted golden henna details. 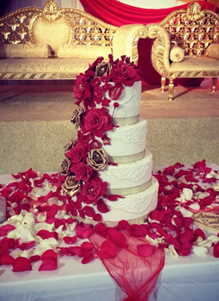 Perfect wedding cake for Asian and Indian themed weddings and receptions. Colour, sizes, henna patternand flavours are fully customisable. Please click here for more information on delivery and set-up charges. 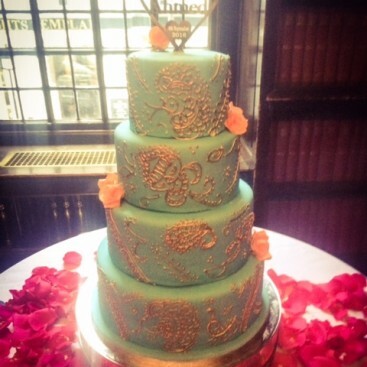 Bollywood Colours II: Wedding cake with hand painted golden henna details. 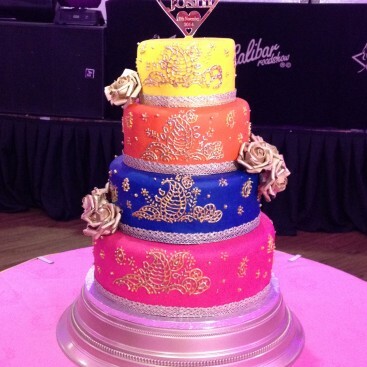 Perfect wedding cake for Asian and Indian themed weddings and receptions. Vibrant colours complimented with gold embellishments. Sizes, colours and cake flavours are fully customisable. Please click here for more information on delivery and set-up charges. 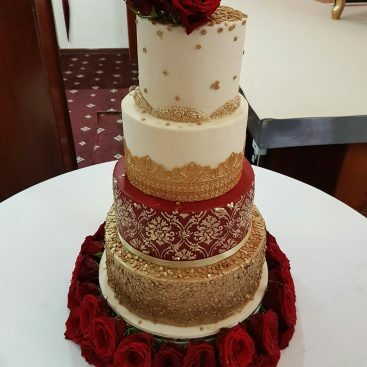 Red and gold wedding cake with hand painted gold edible trim and sugar flowers. 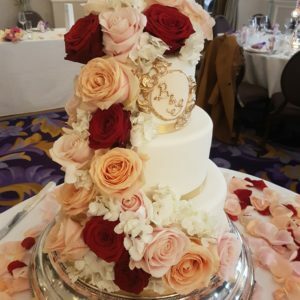 Wedding cake with amazing detail on each tier and fresh flowers. 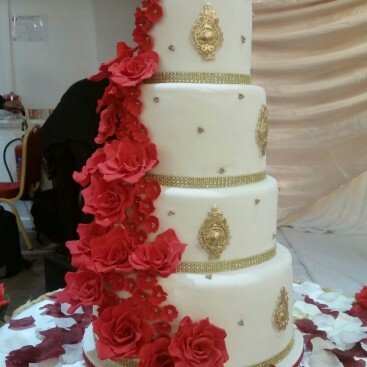 Wedding cake in gold and red with fresh flowers. 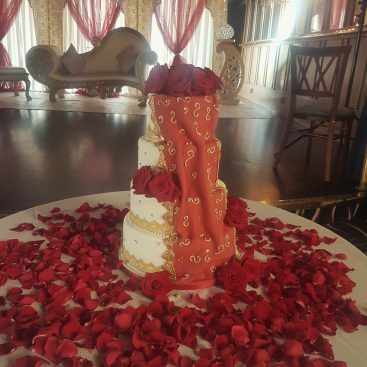 Bollywood Roses & Medallions: Wedding cake decorated with hand made sugar roses and gold decorations. 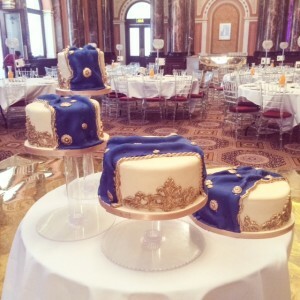 Sizes, colours, gold decorations and cake flavours are fully customisable. Please click here for more information on delivery and set-up charges. 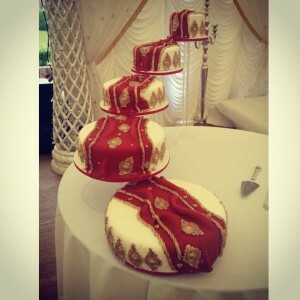 Indian Sari Cake: Wedding cake arranged on stands in sari patterns and colours. 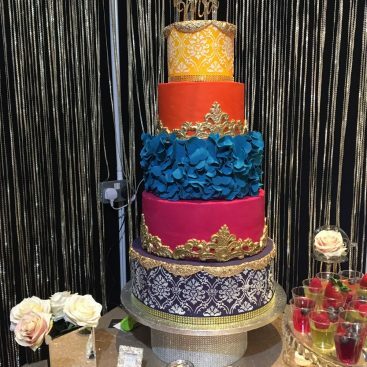 Colour, sizes, sari style, pattern, decorations and cake flavours are fully customisable. Please click here for more information on delivery and set-up charges. The ever so popular sari cake! 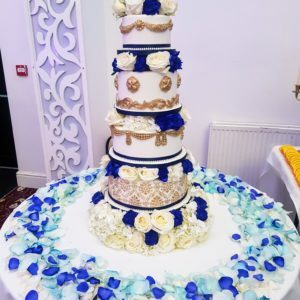 White and gold wedding cake with sugar roses and royal icing stencilling work. Buttercream wedding cupcakes with piped buttercream roses and leaves and sugar sprinkles. Colours and flavours are fully customisable. 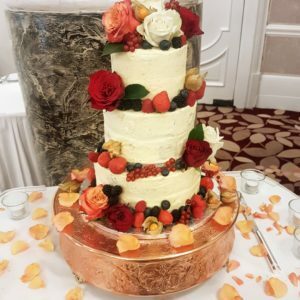 Delicious buttercream cake with fresh flowers and seasonal fruits. 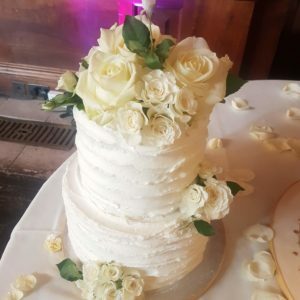 A three tier little beauty with cascading fresh flowers. 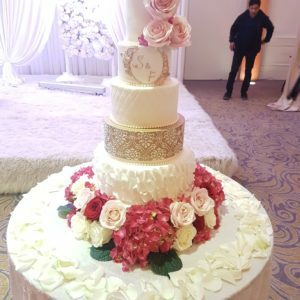 A five tier beauty with fresh flowers (4″ is a fake dummy). 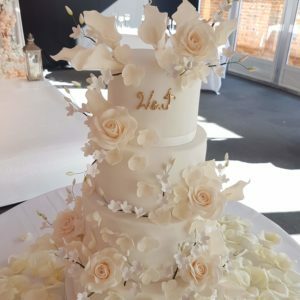 An elegant little beauty with cascading fresh flowers. 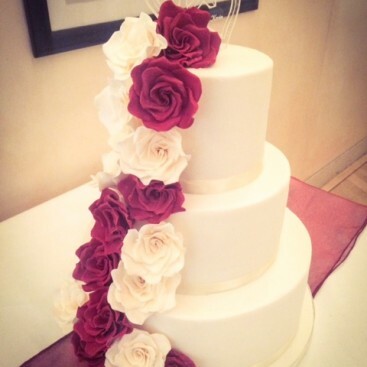 Classic wedding cake with cascading ivory and burgundy roses. Colour, sizes, flower type and flavours are fully customisable. Please click here for more information on delivery and set-up charges.